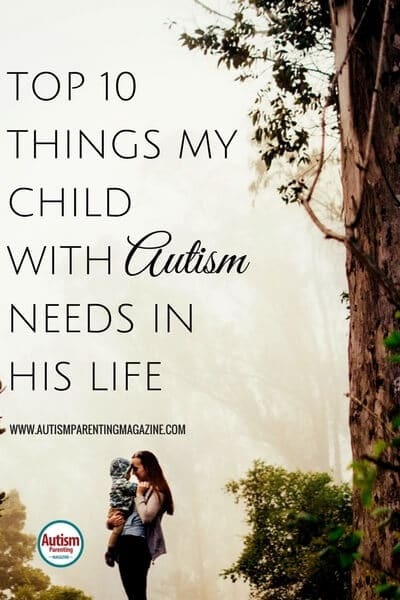 I am asked time and time again what items we use for our son with autism to make his life and our lives easier. So, here is a breakdown of the things that he (or we) couldn’t live without. Disclaimer: These are the things that work for my son, Liam. I am not claiming these things will work for everyone, merely sharing in an effort to help other children. First and foremost, the Crash Pad has been the BEST item we have ever bought for our son. (Thankfully, we were able to get a grant from a local 501c to purchase it.) If you have a child on the spectrum who craves input, loves to smash him or herself off of anything and everything, or just loves rough play, then this is a must have! So what is it? Well, it’s basically like an amped up beanbag pad. It’s quite large (four feet in diameter), and it is filled with bits of furniture-grade foam. (The micro-suede cover is removable and washable too). Your child with autism can jump, crash, smash, and bash off of this pad as much as they want. My son has even used it to head bang. Liam craves the feeling of head banging gently, and this way we know his brain isn’t going to be affected. Note: I said GENTLY. He also enjoys the pressure of the crash pad ON his body. As I said, it’s large and pretty heavy, so it gives his body some much-needed sensory input. Where can you get one? We purchased ours from Amazon. It’s called Jaxx Cocoon Junior Bean Bag Chair. Check around though, because I have since found them cheaper by running a simple Google search. I think this was the first object that Liam ever got to aid him in his journey. He was lucky enough to have his Papa and Nana purchase one for him, and he adores it. Weighted blankets are great for everyone. They increase levels of serotonin and melatonin in the brain, helping individuals fall asleep more easily. Many people use them for autism, attention-deficit/hyperactivity disorder (ADHD), restless legs, and insomnia in general. Whether you’re making one or purchasing one, getting the correct weight is important. Therapists say you should multiply your child’s weight by 10%, then add one or two pounds. Liam’s blanket weighs eight pounds because he weighed 70 pounds when it was made. Wondering where to get one for your son/daughter? Well, there are many places that make them, but we love Peace Weighted Blankets. Their prices are very competitive (these blankets aren’t cheap), but they are very well made. They also make weighted lap pads and weighted stuffies, which are perfect for use at school, in the car, and even for sitting at the dinner table. Liam got his first chewy from his occupational therapist when he was five years old. I sure wish I had known about them sooner! I can’t even count how many shirts he has ruined from chewing the necks! There are many different kinds of chewies, many different textures, strengths, and styles. Some chewies even look like jewelry, such as necklaces or bracelets, which is perfect for kids who are older or more self-conscious of what they wear. My son is an aggressive chewer, so when purchasing for him, I have to make sure they’re sturdier. He also likes ones that have a bumpy or textured side on them. He will often rub it in his hands when he is craving some tactile input. Again, there are tons of places to get chewable items (and I think we may have bought at least one from every store we could find,) so really, it’s up to what your child would prefer. Recently, I was able to review some items from Chewbeads, and I have to say, they held up to Liam’s gnawing quite well! There are times though that he refuses the silicone chewies, and his psychiatrist gave me the best idea of all. Sometimes he craves the feeling of chewing on cloth, thus the reason he never has a shirt with a “normal” neckline. Upon her advice, I took some old tee shirts and simply cut the necks off of them (I left more in the front when I cut it). These are actually his go-to for chewing. He has a basket full of them now, and they can simply be washed with the rest of the laundry. I have also seen other parents use handkerchiefs for their kids too. It all depends on what your child prefers. Liam’s Body Sock has been a godsend. He uses it almost daily, and I love how it’s something we can easily pack it when going to visit family. He loves it because it “squeezes” him. If you haven’t yet heard of what a body sock is, then you definitely need to read this section further. OK, so what are they? Well, simply put, they are a stretchy sock for your body made from machine-washable Lycra. Body Socks are designed to give tactile and proprioceptive input. Basically, it gives you pressure to regulate your senses. They come in many different colors, sizes, and styles. You can even get them as a sheet for your child’s bed to help them sleep better. We purchased ours from Etsy, but sadly, the person who made Liam’s has closed her shop. A simple Google search will help you find the perfect one for your child. Fidgets are HUGE in this house. I keep some in the car, some in my purse, and we take a bag of various ones for when we go places. Believe it or not, Dollar Tree is a great place to stock up on fidgets—most of the ones we have were purchased there. Below I will list our go-to items. These little things are great. I myself have a hard time putting them down. We got Liam’s from Kmart, but you can find them online as well. They aren’t super-expensive either. You can also buy them with different textures, so they won’t only keep your kid busy for a bit, but they will give great tactile input. Another one I have a hard time putting down. You probably know what this is. It’s that slimy—but not sticky—putty that, when manipulated in the container, makes silly noises. Liam loves the feel of it, so it’s one of his go-to things. You can usually find it at Dollar Tree as well. By far, this is my absolute favorite on the fidget list. We first discovered this about five years ago, and it’s now something we always have on hand. You can bounce it, stretch it, and stick it. It’s not sticky. I really can’t describe how it feels other than a bit like mushy circus peanuts candy. These toys really don’t have an official name. They come in different shapes (like animals) and colors. They have an LED light inside. They can be squeezed and stretched, and the bumps on the outside are perfect for tactile input. Another great find from Dollar Tree. Your child may or may not have had these as a baby, but either way, they are a must have for a sensory bag. I try to have Liam use his before we go shopping. It fulfills the input he craves and often keeps him from touching everything he sees in the store. Liam LOVES these things. He’s had various therapy balls and a peanut. The peanut-shaped one is by far his favorite. What’s great about these is that they are so versatile. First and foremost, your child can lay and bounce on them for some needed input. You can use them to help your child work on balancing and strengthening his/her core. You can partially deflate the ball, and then it can be used as a chair. This is great for kids who like to fidget when they sit. My son often uses his during his home school lessons. They can also be kicked and used to play catch (outside or a large room works best for this). The uses for these are truly endless. You can get them at most places that specialize in autism therapy items, or you can head to your local Walmart. We found Liam’s peanut there too! Is your child sensitive to loud noises? If so, these are a must-have. Liam used to wear his in town because the noise of traffic really hurt his ears. He doesn’t wear them as often now, but they come in handy when he’s already overwhelmed (we all know, the less stimuli the better). Many autism specialty shops sell them, but you can also purchase them at Walmart or Kmart. OK, so most of our kids eat a very limited diet. I, for one, feel lucky when my son will eat more than one thing at a time (he usually gets stuck on ONE food for a while, then moves to another). However, there are times when he will eat more than one dish I may be serving for dinner. When this happens, sectioned plates are a must have. Now, you can often find plates with two sections at Walmart, but recently I found some at Dollar Tree that are reminiscent of our old lunch trays. These plates have SIX sections, and Liam (as well as myself) love them. Before I go any further on this one, I need to stress: ASK YOUR DOCTOR BEFORE PROCEEDING WITH MELATONIN. Melatonin is something the pineal gland in our brains produces naturally (as well as endogenously), but those with autism often don’t produce enough. Their circadian rhythm is often out of whack as well. Both of these things affect how our children sleep or don’t sleep. While it is all natural and it can be bought over the counter, it’s important to check with your child’s doctor before using. Liam has been on melatonin for five years now. He also takes a prescription antihistamine that is also used for anxiety to help him sleep more soundly. Liam still only sleeps four to six hours per night and is up at least once per night, but at least he’s sleeping. I tossed this last item around in my mind a lot. It was suggested that I use an iPad here, but to be honest, they’re expensive, and my son doesn’t have one (and I know many children with autism that don’t use an iPad.) He has a hand-me-down iPhone 4, and a knock-off tablet, as well as my older laptop. Of course, he loves all three of these things, but it’s not really THEM that he loves. What he loves about these things is that he uses them to watch YouTube. I call them his magical YouTube machines! At this point, I question why we have the satellite hooked up in his room because all he really watches is YouTube. I know it’s not just my son. Every single autism family I know talks about how their kid watches YouTube all the time. Many of us joke that our kid’s preferred YouTubers owe them a thank you, because our kids are most likely responsible for them going viral. So this is our list. I suppose there are a few more things I could add here, but these are really the TOP TEN in our life. Hopefully you have discovered something new that could work for your child. Which of these would be in your top ten? What would you add? Feel free to reach out to me on Facebook and let me know. Courtney Barnum is a stay-at-home-mom who homeschools her son with autism. He is 10 and also struggles with Bipolar Disorder, ADHD, SPD, and more. In her spare time, she runs an autism Facebook page and writes. In her spare, spare time, she attempts to run a local autism support group. When not doing any of these things, she can be found creating something to feed her artistic side. Courtney Barnum is a stay at home and home schooling mom. Her son Liam, is autistic with Bipolar Disorder, as well as an alphabet soup of other diagnoses. In her spare time, Courtney writes, runs a local autism support group, as well as an autism support/blog page on Facebook.